For most part of its history Iceland has functioned as a ‘regular’ parliamentary system despite having a semi-presidential constitution. For sixty years, since gaining independence in 1944, the president’s role was basically that of a figurehead and the extent of the president’s political actions was, at best, that of managing the coalition formation process. It has been suggested that the president occasionally had preferences over the outcome of the negotiations and sought to influence the coalition formation. It is, however, not clear that the president has had much of a role as a formateur in the formation of governments. Things changed, however, with the president Ólafur Ragnar Grímsson refusing to sign legislation on the ownership of the media into law in 2004. According to the constitution, if the president declines to sign legislation into law it is referred to a referendum. In this instance, however, the government opted to withdraw the legislation. The question whether the president had a right to independently exercise the authority to refer legislation to a referendum was hotly contested. While the 26. clause of the constitution is clear in requiring the president’s signature being required, the debates largely focused on clauses 11 and 13 which state, respectively, that the president is not responsible for the actions of the government and the president lets the ministers exercise his power. Whatever the intent of the authors of the constitution, the constitution was clearly sufficiently ambiguous on the role of the president for Grímsson to recognize, and grab, a politically opportune moment to redefine and expand the powers of the presidency – the government had sought to pass the legislation with little debate in Althingi against the will of the opposition parties and the legislation appeared to have limited popular support. By 2010, when Grímsson next refused to sign legislation, there was far less debate about the constitutionality of the president’s actions – thus, intentionally or not, the Grímsson presidency has transformed the office of the president. Recent events, however, suggest that Grímsson has embraced the more political role of the presidency. Early April, the Panama Papers revealed that Iceland’s Prime Minister Gunnlaugsson (Progressive Party) had failed to disclose his family’s offshore accounts as well as his wife being one of the foreign creditors of the Icelandic banks that collapsed in the financial crisis of 2008. The revelation lead to massive (on an Icelandic scale) protests in front of Althingi and pressures on Gunnlaugsson and his government to resign mounted. Support for Gunnlaugsson’s continued prime ministership within the other coalition party, the Independence Party, appears to have, understandably, declined – further increasing the pressure on Gunnlaugsson to resign. Despite these pressures, Gunnlaugsson appears to have been determined to stay in office. Following a meeting with the leader of the Independence Party, Gunnlaugsson requested a meeting with President Grímsson. What exactly transpired during the meeting is not completely clear. President Grímsson claimed PM Gunnlaugsson asked whether he would be willing to dissolve the government and call an election. Gunnlaugsson, on the other hand, claims that he simply presented the president with what he perceived to be the only two options in the circumstances; for the government to stand united against the opposition’s no confidence motion or to resign. What appears to be clear is that a formal request to dissolve parliament was not made and the claims made by both actors reflect their own, possibly selective but certainly entertaining, accounts of a private discussion. President Grímsson’s, interpretation that a request for dissolution had been made appeared, for example, to rest on his observation that the Prime Minister was accompanied by ministerial staff carrying a briefcase that presumably contained a formal request. It is also important to note that the right of the President to refuse the Prime Minister’s request to dissolve parliament is not uncontroversial – for the same reasons as the President’s ability to refer legislation to a referendum. Thus, Grímsson’s insistence on having refused to the Prime Minister’s request could be interpreted as part of his agenda to imbue the office of the President with real political powers. Whatever the case may be, it appears clear that PM Gunnlaugsson wanted to present the Independence Party with an ultimatum, i.e., either its members support continued cooperation in government under Gunnlaugsson leadership or Althingi will be dissolved and an election called. At the time, the latter option may have seemed unattractive to the Independence party as two of its ministers were also implicated in the Panama Papers scandal and the party’s chances of being in government following an election may also have appeared slim. The Progressive Party’s threat of dissolution, however, never materialized as President Grímsson informed the PM that he would not dissolve parliament and, moreover, called a press conference after the meeting to announce his decision. The President’s refusal to left Gunnlaugsson in a very weak position and, in effect, forced him to resign – although later that day the prime minister’s offices issued a press release to the foreign press indicated that the PM was merely stepping aside temporarily. Thus, it remains to be seen whether Gunnlaugsson plans to return as prime minister (he remains a member of parliament) and, if so, whether he will be successful in doing so. Having flexed his political muscle, Grímsson decided to go back on his decision to not seek re-election. Possibly as he may have perceived his changes of a successful bid having improved by his role in the removal of the prime minister – even though it fell short of the demands of the protesters, most of whom would have liked to see the government removed and an election called. But one might also question the causal relationship here, i.e., it is also possible that Grímsson flexed his political muscle because he had already decided that he wanted to run for re-election or recognized that the political fallout from the Panama Papers opened a window of opportunity for him to hang around for a bit longer. Things, however, took an interesting turn when former Prime Minister Oddsson announced his candidacy – incidentally Oddsson was Prime Minister when President Grímsson first referred legislation to a referendum, thereby forcing Oddsson to withdraw the legislation. Shortly after Oddsson announced his candidacy, President Grímsson withdrew his candidacy – perhaps because he considered his chances of reelection reduced by the Oddsson’s candidacy or, possibly, because he considered his candidacy increasing the chance of Oddsson being elected. While there is no longer any doubt that the president can use his powers to refer legislation to a referendum, views on the role of the president remain divided, i.e., many voters hold the view that the president should be `above’ politics. Thus, in some sense the election is, explicitly or implicitly, about what role the president ought to play. However, as it stands, the leading candidates don’t offer clear alternatives in this regard. From the viewpoint of a political scientist the election would have been far more interesting if Grímsson had not withdrawn his candidacy as his candidacy would clearly stood for the option representing a political president. Instead, the two leading candidates have indicated that they would consider referring legislation to a referendum. However, the question about the powers of the presidency is also reflected in another issue, i.e., the question of constitutional reform. A constitutional council, charged with drafting a new constitution, was established in 2011. A consultative referendum was held on the draft constitution, in which voters expressed substantial support for the constitution and several of its provisions (although voter turnout was very low by Icelandic standards). However, the amendment of the constitutions was never brought to a vote in parliament but constitutional reform remains a part of the political discourse. The two leading candidates do have opposing views on constitutional reform, which is of some significance as the role of the president is probably one of the key issues in the constitutional reform debate. While it is not clear that the constitution drafted by the constitutional council will be the basis of future reform proposals it is worth nothing that although the draft constitution doesn’t remove the president’s ability to refer legislation to a referendum, the significance of this power is reduced significantly by other proposed amendments. In particular, the draft constitution has a provision whereby 10% of the voters can refer legislation to a referendum. Thus, in instances in which there is popular opposition to legislation, it is likely to be referred to referendum regardless of whether the president takes action or not. Indeed, one might argue that the provision actually reduces the president’s powers further. As it stands, once legislation lacking majority support among voters has been passed by Althingi – i.e., the only circumstance in which the president has the ability to decide on the fate of the legislation – the president effectively has to power to turn that legislation into law, i.e., against the will of the majority of voters. The president may also be able to leverage this ‘negative power’ into a positive one – i.e., by bargaining for unrelated legislation in exchange for his signature. When voters can demand a referendum, this power is removed. The question then is whether the election will be fought in terms of the future of semi-presidentialism (or the form it will take in Iceland). That seems somewhat unlikely, the same issues were at stake in the 2012 election and the constitutional form of government received fairly little attention – and it was certainly not focused on close consideration of the political implications of expanding or constraining the powers of the president. 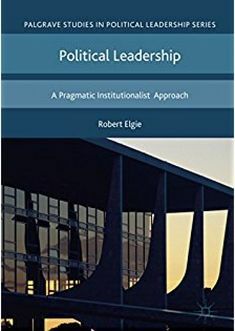 However, even if the campaign is not dominated by discussions of the pros and cons of semi-presidentialism, it doesn’t mean that the election will not have implications for the future of semi-presidentialism in Iceland. Indridi H. Indridason was on the faculty at the University of Iceland from 2003 to 2007 and was the chair of the department of political science for two years. He received his Ph.D. from the University of Rochester. His research is in the areas of comparative political institutions and applied game theory with focus on electoral systems, electoral behavior, coalition formation, and cabinet management strategies. Among his current research projects are i) the determinants of coalition bargaining outcomes including policy outcomes and portfolio allocation, ii) strategic coalitional voting, and iii) the effects of extremist parties on the policy platforms adopted by other (more moderate) parties. His recent work has been published in journals such as American Journal of Political Science, Journal of Politics, British Journal of Political Science, Economics and Politics, and Journal of Theoretical Politics. This entry was posted in Europe, Iceland and tagged Iceland, president on May 31, 2016 by Robert Elgie. This is a guest post by Mariana Llanos and Detlef Nolte, both from the GIGA Institute of Latin American Studies, on their new paper, The Many Faces of Latin American Presidentialism. In 1990 Juan Linz published an influential article in the Journal of Democracy entitled “The Perils of Presidentialism” in which he did not make many favourable prognoses for the recently established democratic, and presidential, regimes of Latin America. He argued that the instability of presidential regimes was connected to its essential features – that is, the principle of dual legitimacy, according to which both the president and the legislature equally derive their power from the vote of the people, and the fixed mandates for both elected institutions. The fixed term introduced rigidities to the system that made crisis and conflict resolution more difficult, and the direct election of the executive and legislative powers gave both president and congress direct democratic legitimacy, thus inducing inter-institutional struggles and making it unclear which would prevail in the event of lack of majorities and a conflict between the two. Although Latin American democracy survived, and the problems that Linz attributed to presidentialism turned out to be less pervasive than he had initially thought, they did not disappeared. In effect, since the beginning of 2016 the region has witnessed two major political crises, in Venezuela and Brazil, which despite being extreme are predictable crises within presidential regimes. In these two cases the presidents face an adverse majority in Congress: in Brazil, congress is using the constitutional mechanism of impeachment to oust President Rousseff, while in Venezuela President Maduro is manipulating the rules of the decision-making process to disempower congress and to avoid a recall referendum that would take him out of the presidency. While presidentialism may be prone to producing political stalemates, political actors are responsible for creating and resolving these stalemates. Brazil and Venezuela represent two different presidential traditions within the region, and the institutional mechanisms being used to solve the current impasse situations differ accordingly. We should bear in mind, though, that crises are profound in these countries and will persist beyond the short-term solutions to stalemate. It appears that the period of fine-weather democracy may be coming to an end and that some of the “perils” and less pleasant traits of presidential democracy may be resurging. “Coalition presidentialism” is the consensual Latin American variant of presidentialism that is practiced in Brazil. Under this scheme, the directly elected president serves as a coalitional formateur and uses his/her appointment prerogatives to recruit ministers from other parties in order to foster the emergence of a legislative cartel that could support her/his proposals in congress for overcoming political deadlocks. Alongside the distribution of cabinet posts, presidents use a wide range of agenda-setting powers and pork-barrelling to maintain control of the legislative process. Coalitions have helped overcome inter-institutional conflicts, but they are demanding for presidents, particularly when they face other challenges. A tough economic situation, scandals, popular discontent, and public mobilisation, expose the weakness of the presidential leadership and may lead to his/her demise. During the third wave of democratization, many presidents have been challenged and 17 presidents have actually been forced to leave before finishing their constitutionally fixed mandates under the pressure of unfavourable majorities in congress and often also of protests in the streets. A few weeks ago, the Brazilian Senate initiated an impeachment process against President Dilma Rousseff who is suffering from extremely low popularity as a result of a serious recession, high inflation and unemployment rates, in addition to the Petrobras affair, a corruption scandal that involves her party (the PT) and many others and that has infuriated the public and motivated protests. Due to these events, latent rivalries among coalition members became apparent, leading to a major break between the PT and the main coalition partner, the PMDB, and giving impulse to the impeachment process. The impeachment resembles previous presidential breakdowns where the president had to leave power prematurely. In these solutions to stalemate where congress prevails, the president has to go and the succession line is activated, but democracy persist. The Venezuelan case belongs to another variant of presidentialism, one based on presidential dominance that has a long tradition in Latin America. It is characterized by the exalted status of the presidency, particularly when the presidential party controls the executive, the legislature, and the judiciary. Presidents may also use their formal powers to either bypass or manipulate the legislative and judicial branches. Presidents prone to unilateral excursions enjoying strong political backing have populated the regional landscape – for instance, as part of the pink tide during the first decade of this century. Hugo Chávez, Rafael Correa, and Evo Morales have exemplified a delegative and hyperpresidential style of government, notwithstanding their participatory discourses. In Venezuela, the president’s loss of a majority after congressional elections at the end of 2015 has left in evidence the autocratic tendencies of the regime. President Maduro managed that his outgoing majority appointed 13 new judges by blatantly violating the constitution. The new supreme court has since then proved to be a tremendous functional instrument for serving the executive and disempowering the opposing Congress. The latest of several controversial measures was to hold up the constitutionality of the two-month state of emergency that had been rejected by congress and that gave Maduro extra powers to impose tough security measures and to deal with an uneasy social context characterized by food and medicine shortage, the economy shrinking by 8 per cent, and an inflation rate of up to 500 per cent. The congressional attempts to get approval for a recall referendum, the constitutional mechanism to depose the president, are also being boycotted by the president-controlled electoral judiciary. We understand that the way in which Maduro is prevailing in the conflict with congress has crossed the line in the direction of authoritarianism. This solution to the gridlock closely resembles the autogolpe solutions (such as that in Peru in 1992), where we saw congress unilaterally closed by the executive and the democratic regime break down. It is quite difficult to predict how the political stalemate, the partisan polarisation, and the economic crisis in Venezuela can be overcome. What would the military reaction be if they were asked to intervene? Whether a presidential triumph in case of gridlock may lead to an authoritarian variant of presidentialism, a congressional triumph also entails the risks of leading to more political polarisation. The latter is connected to the fact that impeachment concerns a president’s misconduct or violation of norms while, in the end, it is the size of the presidential majority that determines his/her fate. It would be more honest if impeachments were replaced by votes of non-confidence (by a two-thirds majority): the political debate would be framed less in normative and more in political-programmatic terms. Certainly, the call for earlier elections would be a more embracing solution for critical stalemate situations. We believe that either of these semi-presidential solutions to gridlock, which have often informally prevailed in similar crises during the last thirty years, are preferable to old-style Latin American authoritarian rule. Mariana Llanos is a lead research fellow at the GIGA Institute of Latin American Studies and head of GIGA’s Accountability and Participation Research Programme. Detlef Nolte is the vice president of the GIGA, the director of the GIGA Institute of Latin American Studies, and a professor of political science at the University of Hamburg. This entry was posted in Brazil, Latin America, Venezuela and tagged authoritarianism, coalitional presidentialism, Impeachment on May 27, 2016 by David Doyle. James D. Boys – Hillary Clinton: Slouching towards success? After a lifetime in politics, Hillary Clinton finds herself at the threshold of greatness. The White House is tantalisingly close, yet the American people remain uncertain what to make of her. The 2016 campaign will either result in Hillary Clinton becoming the first female president of the United States, or it will undoubtedly mark the end of her political career. Though she is far ahead in the delegate count, she has yet to secure the Democratic Party’s nomination, despite the smallest, weakest field of challengers the Party may have ever known. Until she secures the nomination, she cannot turn her energies to defeating her Republican opponent in the general election. To date, the 2016 primary season has demonstrated Hillary Clinton’s continuing struggle to overcome a series of formidable obstacles that have long-plagued her time in public life. Her steadfast determination to appear tough and resilient has ensured that she remains an enigma, removed from the lives of the American electorate. Little, it seems, has been as important to Hillary Clinton as portraying a sense of control, either real or imagined throughout the course of her life. All things considered, this is perhaps not surprising. Raised by a cold and distant father, and married to the world’s most famous unfaithful husband, it is little wonder that Hillary Clinton appears to have created a seemingly perfect public persona that few can penetrate. In an era in which the American electorate has routinely demonstrated a propensity to elect presidents they would choose to share a beer with, however, her struggle to project personal warmth is a serious impediment to her election. A fundamental challenge also exists in regard to Hillary Clinton’s liberal credentials. For many in her party, the New Democrat policies that she and her husband adopted in the 1990s was as unpopular as the New Labour project was with socialists in the UK; it felt like a betrayal of the party principles in a (successful) bid to gain power. Having been out of power for 12 years in 1992, the Democratic Party was inclined to accept such an approach. In 2016, having been in power for the last 8 years, this is no longer the case and explains, in part, why many members of the Democratic Party hanker after a candidate further to the left of the political spectrum. The self-described socialist senator from Vermont, Bernie Sanders, who no one expected to be any serious threat to Hillary Clinton, has defeated her in key battleground states and has repeatedly drawn tens of thousands to rallies across the country as he advocates an approach very different from that being offered by the Clinton campaign. Although he is now mathematically incapable of winning the nomination, his remarkable efforts have drawn Hillary Clinton to the left of the political spectrum in order to gain her party’s nomination, which will force her to reposition herself once again for the general election in the autumn. Hillary Clinton has successfully maximised the financial opportunities that have accompanied her celebrity and political power in the United States. However, her highly publicised lecture fees and book royalties have elevated her income and personal net worth into the stratosphere, beyond the wildest imagination of most Americans. Her wealth is compounded by the amount of time she has spent in the public arena. When Bill Clinton first appeared on the national stage in 1992 he was relatively unknown and could introduce himself to the American public, to whom he was a virtual blank canvas. In the subsequent quarter century, however, the Clintons have rarely been out of the American eye, complicating efforts to present a ‘new’ Hillary Clinton to voters in 2016. Indeed, Hillary Clinton has been omnipresent since 1992, through 8 years of her husband’s administration, 8 years in the Senate, a presidential campaign in 2008 and 4 high profile years as Secretary of State. First time voters in 2016 will have never known an American political landscape that didn’t include Hillary Clinton in one role or another, as she has become part of the establishment. Such a situation presents a challenge to her campaign, eager to portray her as a progressive candidate for change. If elected in November 2016, Hillary would be 69 when she takes the oath of office in January 2017, making her America’s second oldest president; only Ronald Reagan will have been older. The Baby Boomer generation that Hillary Clinton represents is now retiring as the Millennial Generation comes to the fore. The fact that Bernie Sanders has managed to tap into the frustrations of the youth vote is an indication of Hillary Clinton’s status as a member of the establishment, rather than of a reform movement. The experience that she has gained since she last ran has actually proven to be a handicap for her as she seeks to project a readiness to lead, with a vitality that connects her to a youthful demographic. It is a circle she has thus far failed to square. For all of the talk about personality, politics and policy, however, the presidential election is all about electoral mathematics. All considerations must be geared towards securing the 270 Electoral College votes that will secure the White House. Any electoral calculations, therefore, must address the state-by-state approach that the United States adopts on Election Day, for there is no national poll, but rather 50 individual polls that will provide a victor. The popular vote would be nice, but it is the Electoral College that will decide the election, as Al Gore discovered in 2000. The Republicans have only won the popular vote in a presidential election once since 1988, ensuring that the Democrats have secured the popular vote in 5 of the last 6 elections and won 5 of the last 7 presidential contests. The national demographics appear to point to a Democratic victory irrespective of the party candidate, however, with Hillary Clinton’s unique appeal, such a result appears all the more likely. The route to electoral victory will need to ensure that Hillary Clinton retains the overwhelming ethnic minority support that secured Barack Obama’s two terms in the White House and build upon the large female vote that she secured in the 2008 primaries, but which Obama failed to secure in 2012. Such a combination of Latinos, African Americans and women, as well as the usual percentage of white men who would be expected to vote Democrat, should be sufficient to capture the White House in 2016 and propel Hillary Clinton into the history books as the first female president of the United States. This entry was posted in United States of America and tagged Hillary Clinton, presidential election, USA on May 25, 2016 by Robert Elgie. This entry was posted in Austria, Europe, Semi-presidentialism and tagged Alexander van der Bellen, Austria, FPÖ, Norbert Hofer, presidential election on May 24, 2016 by Philipp Köker. US – Can Donald Trump Win the Presidency? I count myself among the legions of political scientists, pundits, and other so-called experts that got it wrong about Donald Trump’s candidacy for the Republican nomination. When he first announced that he was running for president last June, especially in such a crowded field of Republican contenders, I thought that when serious campaigning got underway, the Trump candidacy would fade. Like so many others, I also thought that each subsequent gaffe would surely end his candidacy. Despite the overwhelming media attention, I was skeptical that Trump could turn the hypothetical support he enjoyed in poll after poll throughout the fall into real support from voters. But after losing the Iowa Caucuses to Ted Cruz, Trump did just that with victories in New Hampshire, Nevada, South Carolina, and many subsequent states along the way to becoming the presumptive Republican nominee. In defense of my profession, while political scientists like analyzing numbers, the credibility of polling in recent years has taken a beating. There are now more polls than ever before, but fewer reliable ones. Reliance on cell phones has made polling more difficult, more time consuming, and much more expensive, to achieve a true random sample through random digit dialing. The Federal Communications Commission forbids automatic dialing of cell phones, and as a result, response rates have fallen dramatically. National polls are also meaningless, despite the continual media coverage, since Americans do not elect presidents nor nominate presidential candidates nationally. Many of the state polls last fall that placed Trump and Ben Carson at the top of the GOP race had small sample sizes (around 400, as opposed to the more reliable sample size of 1,000) and would include “registered” or “lean Republican” voters as opposed to “likely” voters. The latter provides the most valid sample, though last fall was still too early to have an accurate read on who was likely to vote. Several polling organizations have gotten big political stories wrong of late, including the extent of the Republican victory in the 2014 midterm elections, recent elections in both Great Britain and Israel, as well as Gallup’s prediction on Election Day 2012 that had Mitt Romney winning the popular vote over Barack Obama 49-48 percent (while Obama won the actual popular vote 51-47 percent). Presidency scholars like myself also like to rely on historical precedents when analyzing potential election outcomes. Dwight Eisenhower was the last political outsider to be elected president, though while he had never held nor ran for a political office, being a five-star general who served as the Supreme Commander of the Allied Forces in Europe during World War II gave him tremendous credibility with voters in 1952. And while several “outsider” candidates have sought the presidency since then, the most notable success belongs to Texas businessman H. Ross Perot, whose independent campaign in 1992 garnered him 19 percent of the popular vote (though zero Electoral College votes). To say that Trump has re-written many of the rules of presidential campaigns this past year would be an understatement. And now that Trump has proven so many of us wrong with his success in becoming the presumptive Republican nominee, the question is whether Trump can extend his winning streak to capture the White House in November. I recently told students in my Media and Politics course that I am officially out of the prediction business, but I offer this perspective as a political scientist on how Trump can win, and why many who say that Hillary Clinton (if she is, indeed, the Democratic nominee) will easily win in November might be wrong. First, one of the most important tasks for Trump (or any nominee) is to unify the party before, during, and after the national convention. Despite the #NeverTrump movement, Trump’s bombastic style of campaigning, or the sometimes brutal way in which Trump went after his political opponents, one important fact remains—by early May, it was the Republican Party that had wrapped up its nomination contest. The Democrats, it seems, won’t have a final answer until June 7th, when California, New Jersey, and a handful of smaller states vote. One year ago, no one would have predicted this outcome, as Clinton was supposed to easily defeat Sanders and any other competitor for the Democratic nomination, and the large Republican field was supposed to battle it out until the last contest or even into the convention. Instead, Trump and the Republican Party have already shifted to focus on the general election, while Sanders keeps his slim hopes alive by continuing to beat Clinton in primary contests (like his win last week in Oregon, or the virtual tie in Kentucky due to the proportional allocation of delegates). Second, as the momentum and enthusiasm for the Sanders campaign continues, so too does the overlap on key issues important to both Sanders and Trump supporters. Assuming Clinton will eventually win the Democratic nomination, the question remains, what will Sanders supporters do? Clinton has not generated enthusiasm among progressives, and Sanders’ anti-establishment message often hits the same points as Trump’s message: Creating better paying jobs, getting big money out of politics, ending corporate welfare and crony capitalism, and ending unfair trade deals. Whether Trump can co-opt any of this support remains to be seen, though the dissatisfaction with the Democratic establishment among Sanders supporters is palpable, as witnessed last Tuesday during a large Sanders rally in Southern California when the mere mention of the Democratic Party set off a loud round of boos from the crowd. Third, Trump has promised to put new states in play this fall, shaking up the traditional red-blue divide of the Electoral College. Again, time will tell if that can happen. The so-called Rust Belt states will loom large, including Ohio and Pennsylvania. While Pennsylvania has not gone Republican since 1988, Nate Silver just last week identified it as the “tipping point state,” which means he predicts it to be “the state that provides the presidential winner his or her 270th electoral vote when all the states are rank-ordered by his or her highest to lowest margin of victory.” (See the article here: http://fivethirtyeight.com/features/pennsylvania-could-be-an-electoral-tipping-point/). Much has already been made about Trump’s support among white, working-class men, and higher turnout among this demographic can help to offset the expected gender gap that Trump will face with women. This entry was posted in United States of America and tagged presidential election, USA on May 23, 2016 by Lori Cox Han. Dubbed the ‘coup-coup islands’ due to a legacy of violent government takeovers, the small African island nation of Comoros (population: 800.000) has long been one of the most politically unstable countries in the world. Upon attaining independence in 1975, one of the four Comorian islands – Mayotte – voted to remain part of France, and in 2011 became a French Overseas Department. While the French incorporation of Mayotte was considered illegal by the United Nations, the significantly higher standards of living on this island stimulated secessionist aspirations on the two smaller Comorian islands – Anjouan and Mohéli – which also desired to be released from the largest island of Grande Comore, and to be reunited with France. After nearly three decades marred by successive coups, violent uprisings, and enduring economic malaise, in 2002 a unique electoral system that provides for a rotating presidency between the three islands was adopted. Every five years, a president from a different Comorian island is elected for a single term. Presidential elections are held under the French two-round system, but in the first round only voters on the island delivering the next president can participate. The three candidates with the most votes take part in a second round, in which all eligible Comorian voters can cast a ballot. The first elections under the new system were won by Azali Assoumani from Grande Comore, who ruled the archipelago until 2006. Subsequently, presidents were elected from Anjouan (2006 – 2011) and Mohéli (2011 – 2016). While the economic situation on Comoros remains dire, and political violence has not been completely eradicated, the fact that all presidents elected under the new system were able to complete their term in office is widely regarded as a considerable achievement. On 21 February 2016, the first round of a new presidential election was held on Grande Comore, which according to the constitution would deliver the next president. The outcome was close, and the top three candidates all obtained between 14 and 18 per cent of the votes. Among them was former president Assoumani, who in 1999 had staged a successful military coup, and contemporary vice-president Mohamed Ali Soilihi, who emerged as the winner of the first round. The second round of voting, which was held on 10 April 2016, again resulted in a very close outcome: Assoumani was declared the winner with 40,98% of votes, while Soilihi finished second with 39,87% of votes. While international observers considered the election to be free and fair, and the UN Secretary General congratulated the Comorian people with a peaceful election process, numerous irregularities were reported from the island of Anjouan, among which broken ballot boxes, accusations of ballot stuffing, and acts of violence. As a result, the Comoros constitutional court ordered a partial re-run of the election on this island, which occurred on 15 May 2016. Only 2% of the Comorian electorate was allowed to participate in the re-run, which did not produce a significantly different result: Assoumani remained the winner with 41,43% of votes, while Soilihi remained a close challenger with 39,66% of ballots cast. The recent Comorian presidential election once more underscored the fragile political situation in the archipelago, which remains plagued by inter-island hostilities and separatism. The lack of a single Comorian identity, as well as the divisive effects of the integration of Mayotte into metropolitan France, continue to undermine economic and political progress in the island nation. Economic growth dwindled from 3,5% to 1% over the last two years, and while the new political system has put an end to the series of violent coups, it has not solved the formidable challenges and obstacles that continue to beset the Union of the Comoros. This entry was posted in Comparative politics, Europe, France and tagged Comoros, Separatism on May 19, 2016 by Wouter Veenendaal.